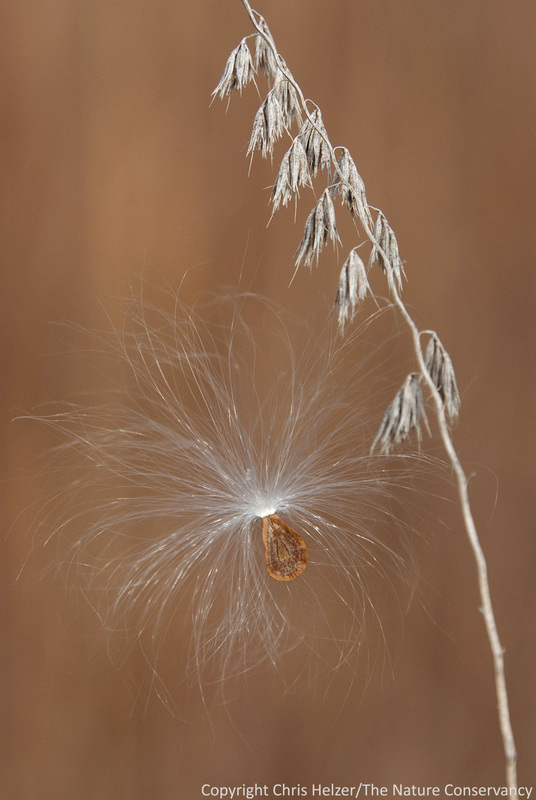 I actually saw this seed detach from a milkweed pod and float away on a breath of wind. I tracked its flight until it got stuck – ever so slightly – on the seed head of a nearby grass plant. I had just enough time to plop my tripod down, focus quickly, and squeeze off one shot before the gentle breeze lifted the seed again and carried it out of sight. A butterfly milkweed seed clings (briefly) to the seed head of sideoats grama. Lincoln Creek Prairie – Aurora, Nebraska. It was one of those rare, but gratifying, times when I actually caught a fleeting image with my camera. Near misses are much more common – see earlier blog posts on photographing prairie dogs and bees, for example… In fact, I often have to remind myself not to get so wrapped up in the (often fruitless) attempt to capture an image photographically that I forget to simply enjoy the moment. This time, I got both the image and the enjoyment, which means I get to pass both along to you.